The food listed are not in any particular order, it's just so happened I recalled about it etc. 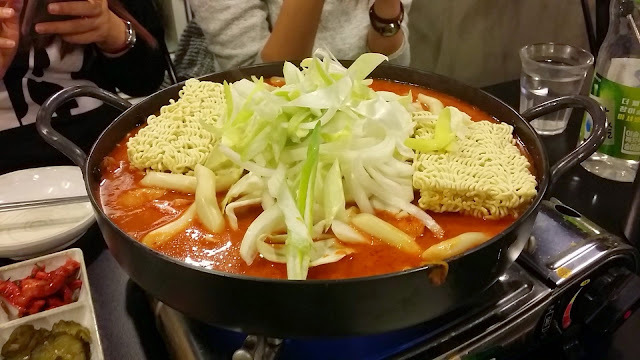 I tried to not include food like Korean BBQ (Gogigui), or Korean rice cake (Tteokbokki) etc, something that you will sure eat when you are in Korea anyway. 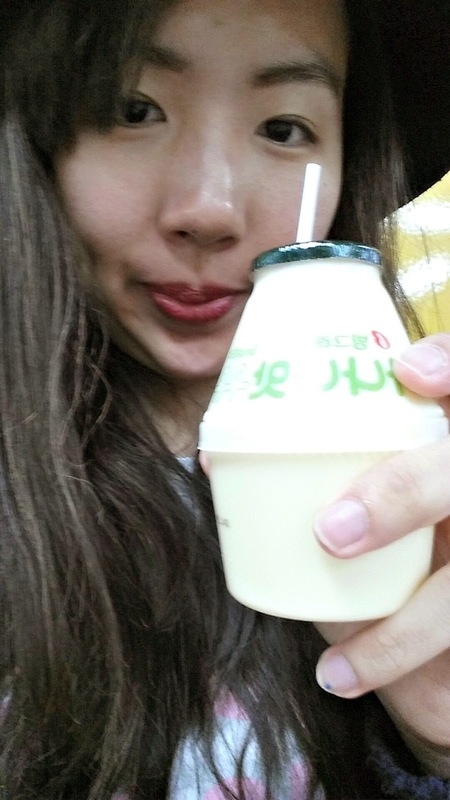 I know almost everywhere is selling this but taste the authentic one in Korea!! What's more, not every country have it in bottle. I had this for breakfast every morning and sometimes for supper/dinner because it's this good. I dislike eating seafood and in actual fact I don't eat any except for fish?? But for once I am willing to try something new and guess what? The sesame oil has made it taste a bit better. 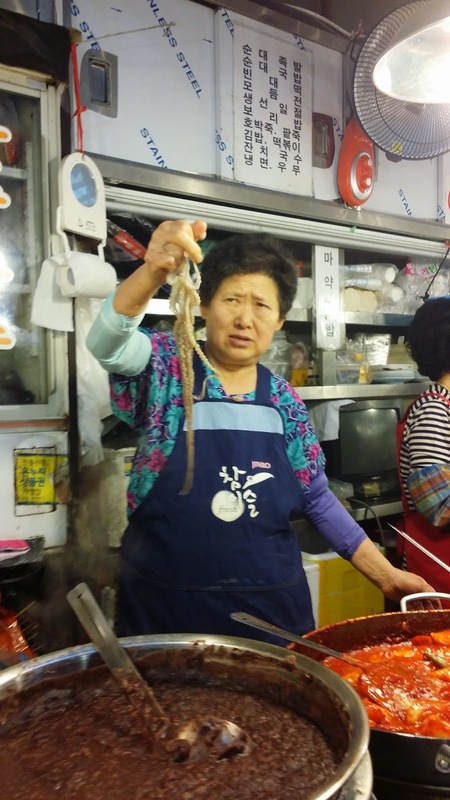 Apparently this live octopus is tasteless lol (p/s actually anything raw is quite tasteless). Tried it for the experience but it's pricey HAHA. Cheapest place: I have no idea. I got mine at 15,000 wons. 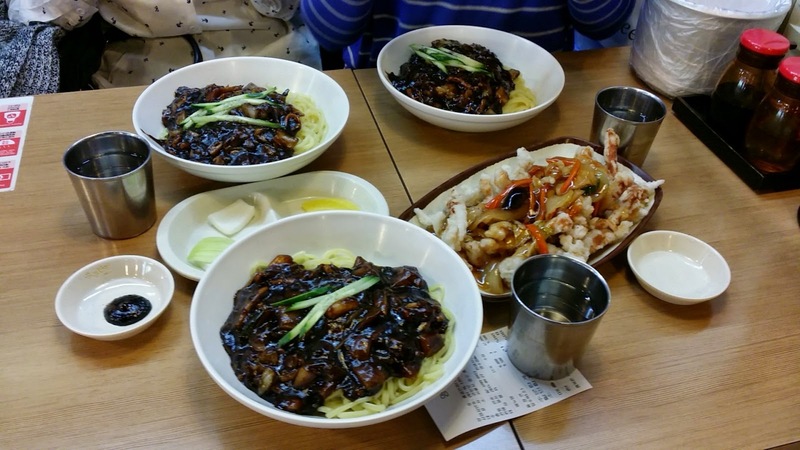 It might look disgusting but trust me this is the best Jajangmyeon I have in my life. 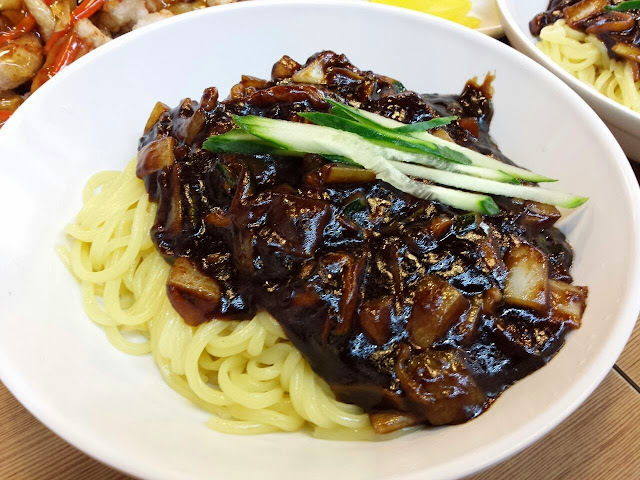 What's with the Jajangmyeon in Singapore man seriously lol. Although I dislike yellow noodles, the black bean sauce just makes it so much more bearable and I totally forgotten that I was eating the yellow noodles (because it turned black anyway). Cheapest place: I have no idea, guess the prices are around the same? Got mine at 3,500 wons. Recommended by our hotel staff and it wasn't even a disappointment. At first I thought it was chicken feet due to the picture. But then again it looks like the octopus. 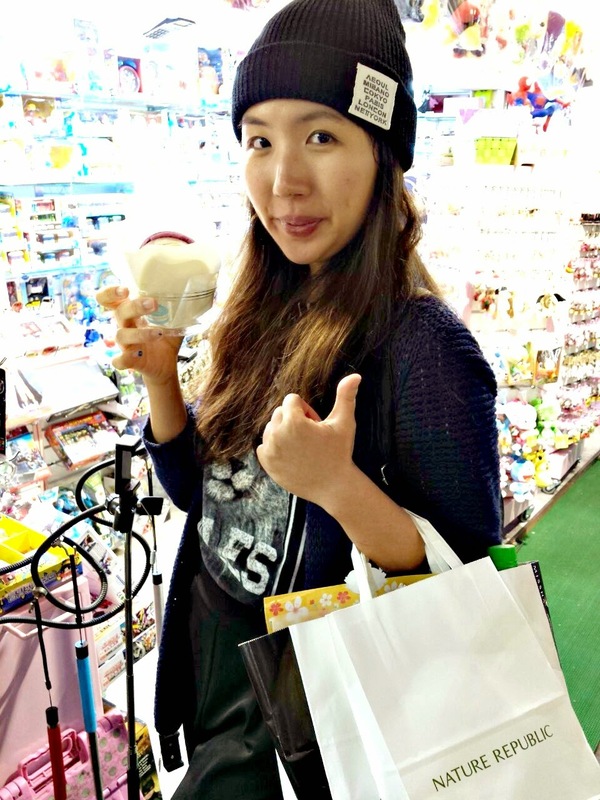 HAHA however, when we saw the words "糖醋里脊", we know this is something we need to try. The thing is, it tasted like french fries and it's not even sour? Or even sweet. Just some random sauce. But it makes the food nice so I am fine with it. However, you need to finish it quick before the thing starts to cool down and stick all over the place. Starch as what my friends said, caused all these. Cheapest place: I have no idea, guess the prices are around the same? Got mine at 9,500 wons. Words can't describe the differences between the usual fried chicken I have tasted for the past 19 years and this one in Korea. The skin is so crispy that I don't even feel guilty eating them? The meat is just so juicy and tender I can't believed I am describing a chicken this way. THIS IS WAY TOO MUCH FOR ME TO HANDLE. Cheapest place: I have no idea, guess the prices are around the same? Got mine at - Kyochon (delivery), Honey & Spicy Chicken. 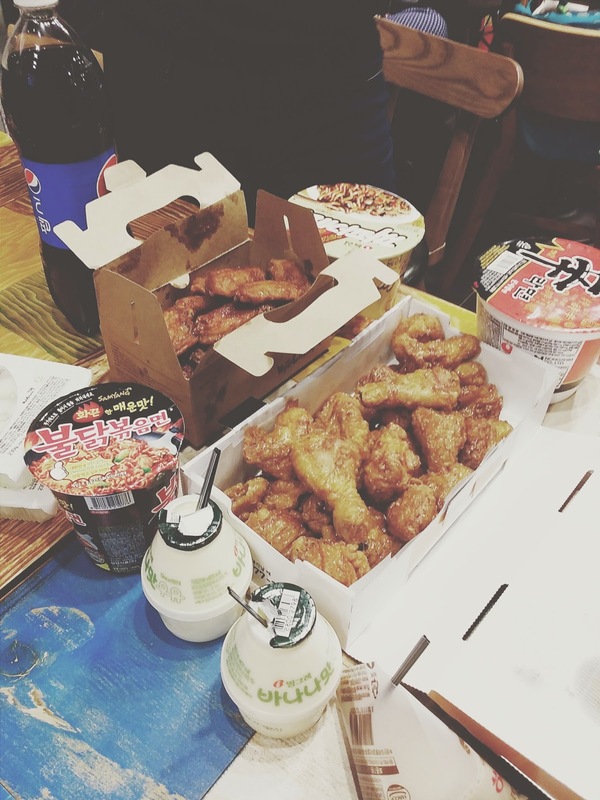 Around 20,000 wons for the chicken (each box). Best instant noodle so far. Although it's spicy (they labelled it as 5/5 spiciness), this noodle is addictive yet nice. 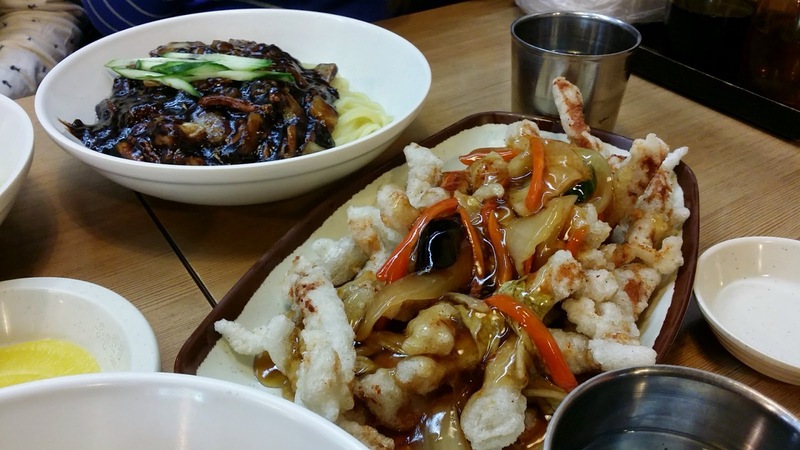 Had this for dinner/supper for a few nights in Korea and also when I am in Singapore. I personally won't label it 5/5 as it's not THAT spicy to me. It's more troublesome to cook it in a cup as you need to drain out the water before adding in the sauce. 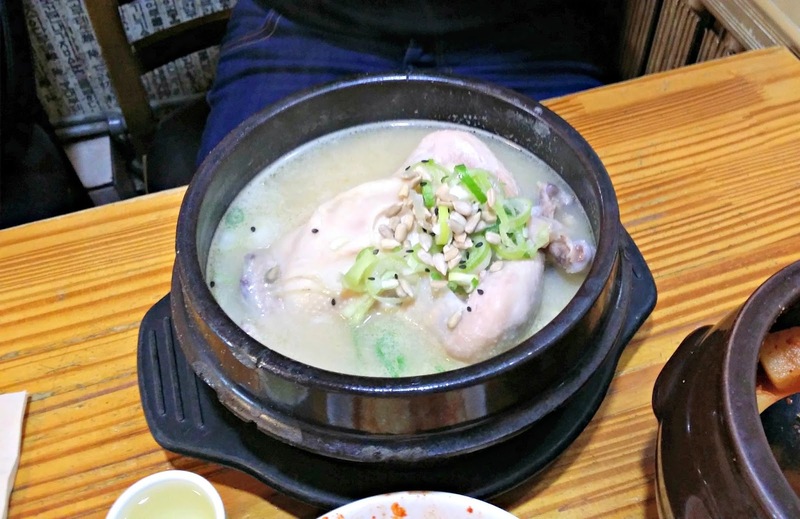 Not all army stew are nice in Korea. I tried two different one in Seoul and I personally think that the first one (at Hongdae) is better and also it has more ingredients. The second one I tried at Express Bus Terminal was so disappointing. I felt like I just spent money on eating something so simple like sausages and hams (canned food)?? Although the sausages are way better than Singapore's one, it's just disappointing that they don't even have meat like chicken/beef wts. And the price differences not say very huge. Cheapest place: Depends on ingredients of course. Not my first time having Ginseng Chicken but this is much better than the one I had previously. Although there was a really long queue when we arrived (apparently this is a really popular place to eat Ginseng Chicken), we didn't wait for very long. At most 30mins? The queue was moving really quickly because the staff inside are fast and efficient HAHA. Love the atmosphere and also the kimchi they served, food was served really quickly too. The place is huge and you got to 'choose' (more like they assign you) to either a room where you have to remove your shoes and sit on the floor just like Koreans or another room where you sit on the chair. So glad they gave us the table and chair one because I find it pretty troublesome to remove shoes and wear it back later + I am not used to sitting on the floor and eat my food. The toilet was extremely good too (especially the toilet bowl with so many functions HAHA). For the food, the chicken is just nice for one person and I love the rice inside. I even ate the ginseng after everything because it's good for your body anyway. Remember to add some ginseng soup (?!) inside your soup to enhance the favour. Best served when it's hot. Cheapest place: Not sure, mine cost 15,000 wons. 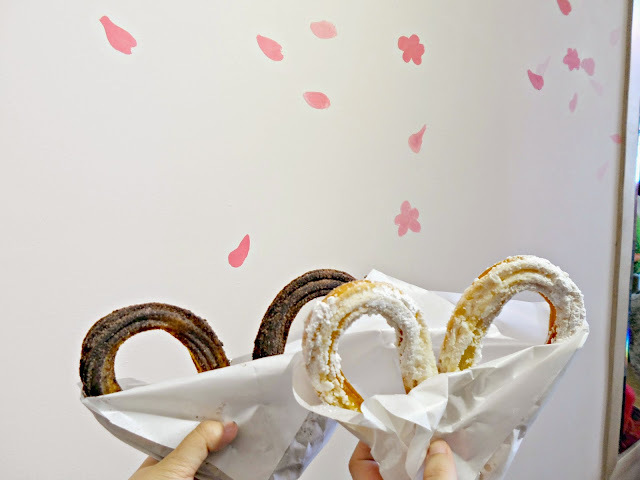 In such a cold weather, it will be good if you get to enjoy some warm/hot churros with hot drinks. I had this when we were somewhat lost finding Ihwa Mural Village so I can't really tell you where is it exactly. Maybe you can try getting lost and you might ended up here as well HAHA. Cheapest churros I saw in Korea and also the biggest. I had this for lunch (wanted to have it for tea break but ended up being too full from this) and it's totally worth the money. The owner only fried it when you order so it's definitely going to be served when it's hot. Be careful when you hold it. Downside is that it's pretty messy when eating it, my mouth was filled with the chocolate powder and they just kept dropping onto the table. But very crispy I would say and delicious too! Cheapest place: Should be at this place? Got mine at 3,000 wons in this size. 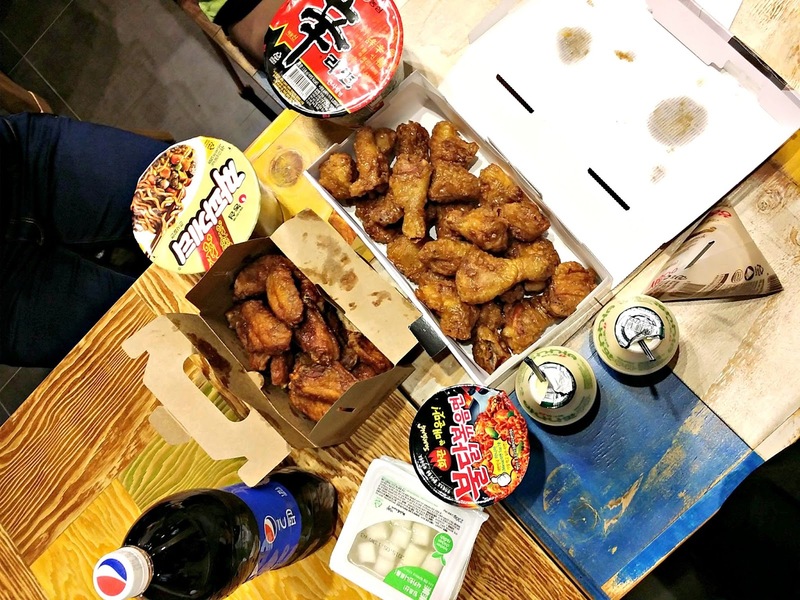 We decided to spend a night eating all the street food in Korea at Myeongdong and I ended up feeling a bit too thirsty and oily (It felt like I drank oil the whole night). But thank goodness for this. It's so huge??! What's more it's really nice to have ice cream in between, mind you the ice cream is huge too. But you will have to let the ice cream melt a bit before eating or else it will be way too hard. 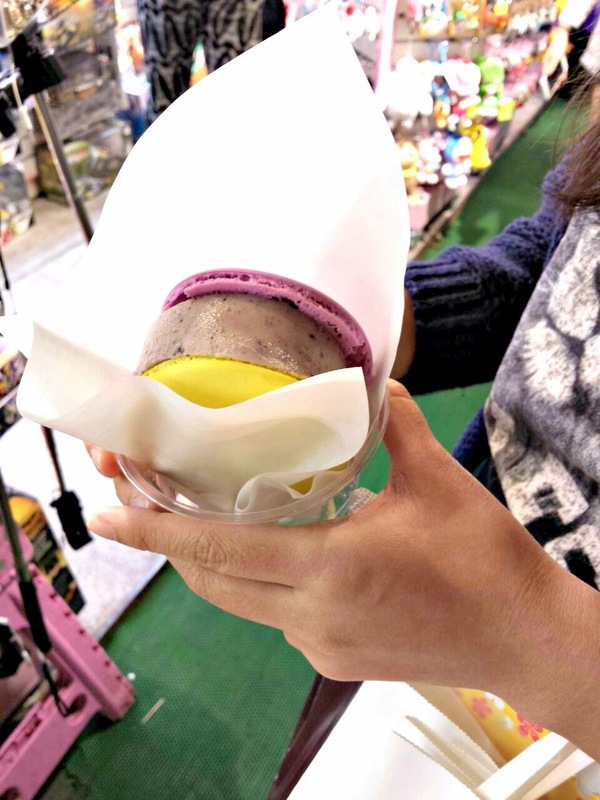 You get to choose different flavours but I don't taste anything from the macaroon (just taste sweet ha but it's chewy and nice) except the ice cream. 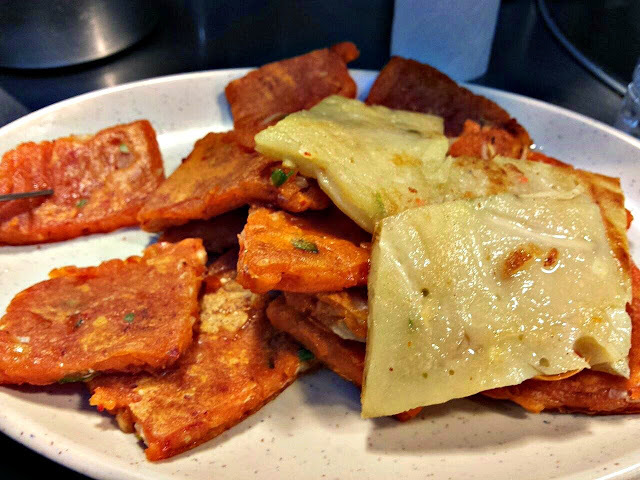 I myself is not a fan of kimchi pancakes although I love kimchi. I just find it weird that you can having kimchi with flour. This is why I was a bit hesitating when my friends asked me to try this. But guess what, no doubt the best I have ever eaten. So crispy and nice?? 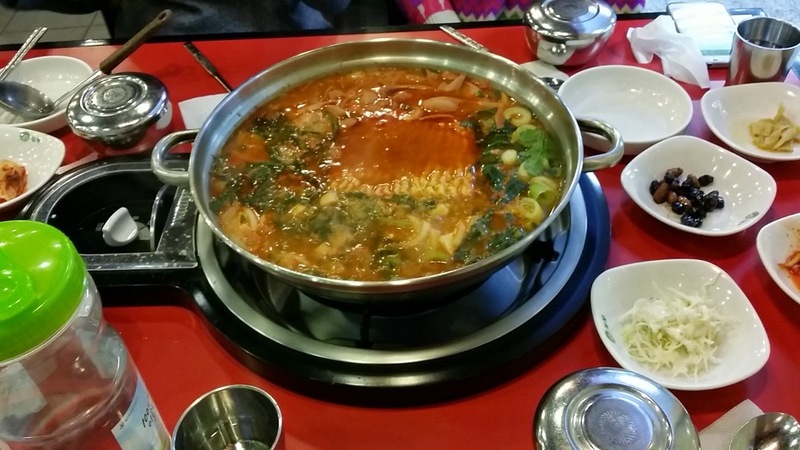 Although it's not spicy/sour any more but at least I don't taste flour instead of kimchi. It seems like they used minimal flour for this HAHA. So when someone like me who doesn't like kimchi pancake recommending you to eat this, you know this is really something. Can be found at: Anywhere I guess?